Another 21K and I feel great! It was 4°C (about 39°F) with a bothersome drizzle and according to the Weather Channel, humidity was at about 80%… I’m guessing the remaining 20% was hiding inside my body because my bones started to ache as soon as I got out of the car and made my way to the starting line. To say it was so cold you could see your breath would be an understatement. November 24th, 8:00 AM at Parque Fundidora. Exactly one year after my first 21K, I set out to repeat this distance and achieve another personal milestone as an amateur runner. My training building up to this day had not gone exactly as planned, due to a series of business trips and events but more importantly, two ankle injuries which had made me interrupt my distance schedule. However, I had reached a comfortable 17K during the last week of training so I was confident about being able to finish in one piece. Then on Thursday evening, Monterrey went from autumn to winter in a heartbeat. I could picture every runner going online and constantly checking the weather forecast for Sunday morning, hoping for a little bit of sun… I sure as hell did. By Friday evening it was certain, the cold and rain had set it and the best we could hope for was a 4°C low and a 7° high, which was exactly what we got on Sunday. I had never run in such cold weather so even though I was supposed to rest on Saturday, I decided to do a 7K practice run in order to check how my body would react. It was also a good exercise in order to figure out what running gear I would wear for the race. I wore a light jacket with a long sleeve dry-fit shirt and running pants but after about half a kilometer I could feel it weighing me down and suffocating me a bit so I decided I would run the 21K wearing compression pants, an Under Armour long sleeve and the race’s short-sleeve t-shirt. After my last practice run, I went home and began writing the names of people who enrolled on my “Run it Forward” event on my t-shirt. “Run it Forward” is something I came up with last year in order to give me extra motivation during training and the race itself. Basically, I dedicated Kms. to friends and family in exchange for them committing to some form of positive action towards their own lives or the communities around them. This year 31 people supported my run with these commitments so I ended up grouping some people in the same Km (like my good friend Righel said, maybe my next Run it Forward will have to be a marathon). 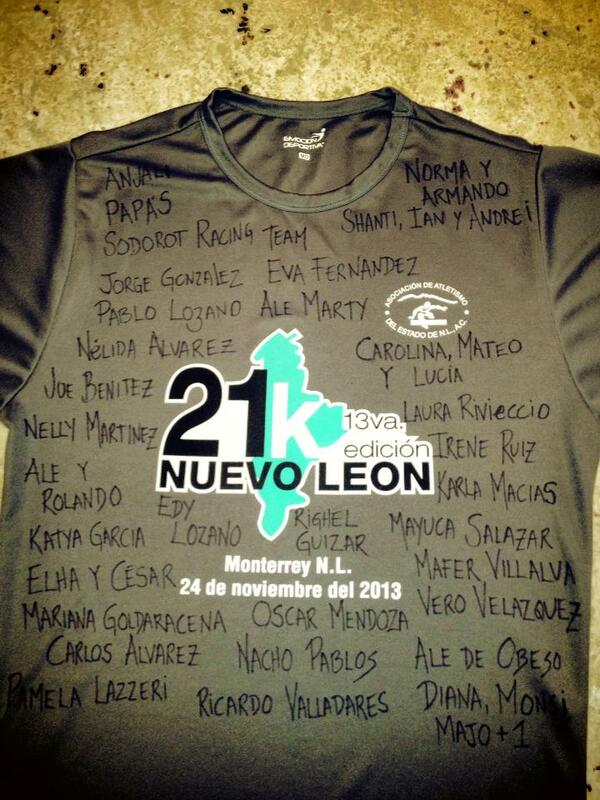 I would like to take this moment to recognize and thank each and every person who supported my second 21K. You guys made ALL the difference and gave me 31 reasons to go through with what I thought was crazy as soon as I felt the cold breeze during the first hours of Sunday morning. 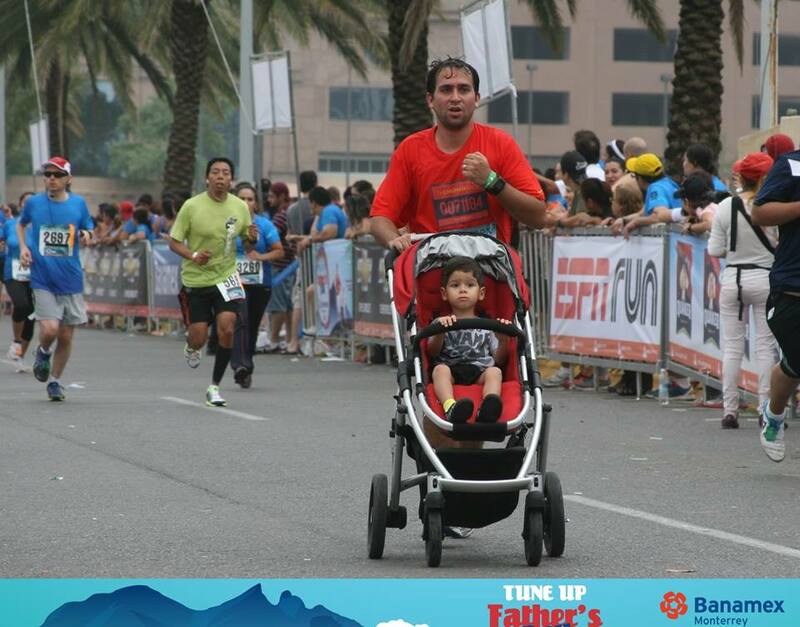 If I was running just for myself and my pride, I could have easily dropped out of the race or lowered my pace. It’s easy to succumb when the only person you have to answer to is yourself. Thanks to you guys running it forward, in every step I took I took ownership of your personal commitments and that drove me all the way to the finish line. Thank you, Nélida, Joe, Norma + Armando, Carlos, Shanti, Nacho, Laura, Nelly, Anjali, Mayuca, Irene, Sodorot Racing Team, Karla, Pablo, Jorge, Eva, Righel, Ale, Kishore, Alejandra, Edy, Ale + Rolando, Katya, Elha + César, Mariana, Ricardo, Oscar, Mafer, Pamela, Vero and last but definitely not least, Carolina + Mateo + Lucía. 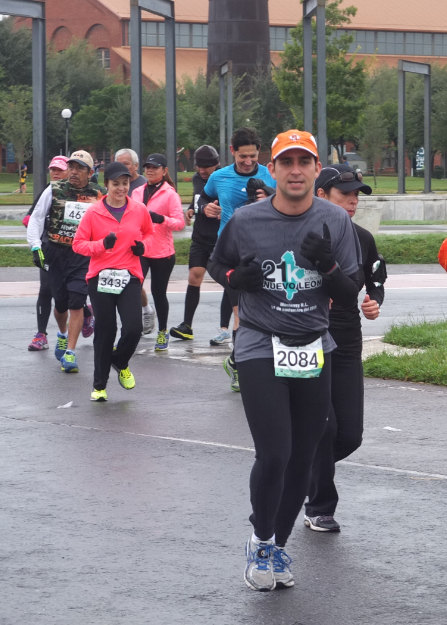 From the Sodorot Racing Team, a special thanks to Ángel who accompanied me during the last 6K of the run and took some awesome pictures. I had created a running playlist on my iPod but I guess the cold froze my brain early in the morning because I left my iPod at home, so I ran without music. This was definitely a new experience for me, as I ALWAYS run with music and it actually helps me set a beat and get my mind off the running itself. I set my Nike Sportswatch to show me distance and average pace and decided I would not check time elapsed until I finished the race. The first 11K I ran next to Cirilo, a colleague from work who is usually faster than I am and is training for his first marathon. The route was not without its share of surprises, including a series of overpasses which challenged my legs not to cramp up. After the 11th, Cirilo sprinted ahead but I kept my pace, surprised at the fact that after a few kilometers of my legs aching due to the cold, my body temperature had risen to a point where the cold was bearable. After the 15th , my friend Angel joined me for the last leg of the race (and took some cool pics in the process). As I approached the finish line, sweat had dripped down my face and my contact lenses were watery so the goal line clock was blurry. Still, I thought I read the numbers right and surprisingly I was 3 minutes and a half under my time from last year. Later, I corroborated this by checking my official chip times. Under far from comfortable weather conditions, somehow I had been able to best myself. That’s an awesome feeling! Let it be said that I am not at all a fast runner, but that’s ok. I don’t attempt to win any Olympic medals but it’s still great to see that I was able to push mind over body and achieve the objective I had set myself out to. The biggest objective I have when I run, is to attempt to stay fit so I can live longer and spend more time with my family. I was not born the healthiest baby but with perseverance, I’ve pulled through and developed my body to a point where I can withstand somewhat heavy physical activity. This would not be possible if I did not have my wife and two kids as my most important motivators. Thank you Carolina, Mateo and Lucía. Thank you for all your support and love. You are my world. Además de ¿dónde corres?, esta es la pregunta que recibo más veces cuando platico respecto a mi afición amateur por correr. 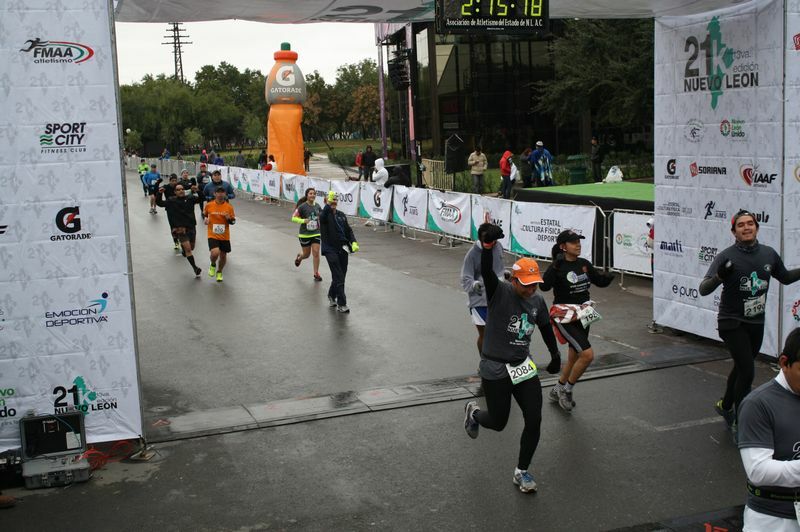 Desde antes de que se viniera la actual popularidad por este deporte, los Clubes de Corredores han sido la constante en las carreras de 5, 10, 21 y 42K en la Ciudad de Monterrey. Hay muchísimos y cada uno tiene sus propias características, personalidades y atractivos. En las carreras es común verlos iniciando en grupo o identificar sus playeras a lo largo del trayecto: Gusanitos, Correcaminos, Runners North, SCYF, Lili Figueroa, Don Gato y su Pandilla, etc. 1) Ayuda a la fuerza de voluntad. Ser parte de un grupo te liga a él y te ayuda a mantener una disciplina. Funciona como presión social pensar que “si no me despierto le voy a quedar mal al grupo que me espera para ir a correr.” Si te quedas dormido, la próxima vez será material para carrilla que se te pegaron las sábanas. Además, si ya pagaste por pertenecer, querrás sacarle el máximo provecho (a menos que tu lógica vaya en contra de la lógica económica). 2) Apoyo del grupo. Tus compañeros conocerán los objetivos que te trazaste para la próxima carrera. Sabrán tu reto y en el trayecto, es garantía que te apoyarán. Te darán palabras de impulso, te aconsejarán en la preparación, etc. 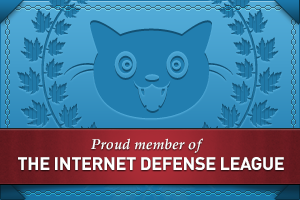 3) Expertise. Sí, correr es relativamente simple y podría ser material para que Cortázar escribiera “Instrucciones para correr” pero también es cierto que el entrenamiento no es poca cosa y correr mal (porque sí se puede correr mal) puede llevarte a lesiones. El expertise que te ofrece un club al generarte planes de entrenamiento individuales y/o estarte observando en tu preparación, es muy importante. Además, estos planes pueden ser muy efectivos si estás buscando bajar tus tiempos. Todos sabemos correr, pero no todos sabemos correr bien. Eso se aprende y es bueno tener maestros. 4) Camaradería. Depende de la naturaleza de cada club, pero sus integrantes tienden a llevarse bien y generar un espíritu de comunidad. Habiendo listado estas ventajas (que no son las únicas), ¿por qué no me he unido a un club de corredores? Simple: correr para mí es un espacio de desconecte. Durante mis entrenamientos, yo corro para estar conmigo mismo. Es mi espacio para tener conversaciones internas y enfocarme en mí. Aprovecho para evaluar cómo me siento física y emocionalmente, planeo mi día y festejo personalmente haberme levantado de la cama y poderme haber dedicado ese espacio. Dicha celebración (en mi caso), no requiere gratificación ni validación de otros. Yo no corro con el objetivo y ambición invertida en bajar mi tiempo. Me encanta cuando lo hago pero también sé que porque me permito ser un corredor indisciplinado, mis resultados dependen de muchas variables. Es rara la vez que permito que una carrera se interponga con mis planes de convivencia del día/noche anterior, por ejemplo. En varias ocasiones he corrido 10K la mañana después de haber ido a una boda y aunque no es algo que recomendaría bajo el título de “Consejos del buen corredor”, nunca me he arrepentido de ello. Cuando sí doy mayor seriedad a mis horas de sueño, alimentación, etc. es en caso de correr un 21K (nunca he corrido un maratón) o una carrera de obstáculos, ya que estos trayectos exigen mayor esfuerzo. Hasta ahora, mi cuerpo me ha permitido esta libertad. Respecto a apoyo por parte del grupo, aunque definitivamente debe ser bueno tenerlo por parte de tu club, algo que me encanta de las carreras es que por su misma naturaleza, a menos que seas uno de los 10-15 corredores que están buscando podio, esa camaradería existe entre todos los corredores. Es raro el corredor que te hace algún comentario negativo y al contrario, es común recibir y dar palabras de aliento en tu trayecto. Los espectadores en las carreras, aunque no te conozcan, nunca escatiman en regalarte un “ánimo, tú puedes” o una sonrisa. Hasta ahora no necesito más. Viva el internet y la generosidad: aunque no son personalizados, hay muchos planes de entrenamiento, tips, consejos, técnicas para estirar, etc. gratuitos en internet. Los usé al principio y me sirvieron por ejemplo, para trazar un plan para correr mi primer 21K. Además, cuando me he topado con dudas que no resuelvo en un Google Search, he contado con la generosidad de amigos con mayor experiencia que han podido darme todos los consejos que necesito para ejercitarme y practicar este deporte de manera no competitiva. Mi misión es simplemente mantenerme saludable y disfrutar el camino. Por eso hasta ahora no me he unido a un club de corredores. Nike Sportwatch GPS powered by TomTom: Shortest review ever. Worth every penny. It’s awesome. Gracias a @diegodelpozzo por compartirlo. ¡Nos vemos en la calle, locos!